I just wanted to share a neat recipe I found a few weeks back. 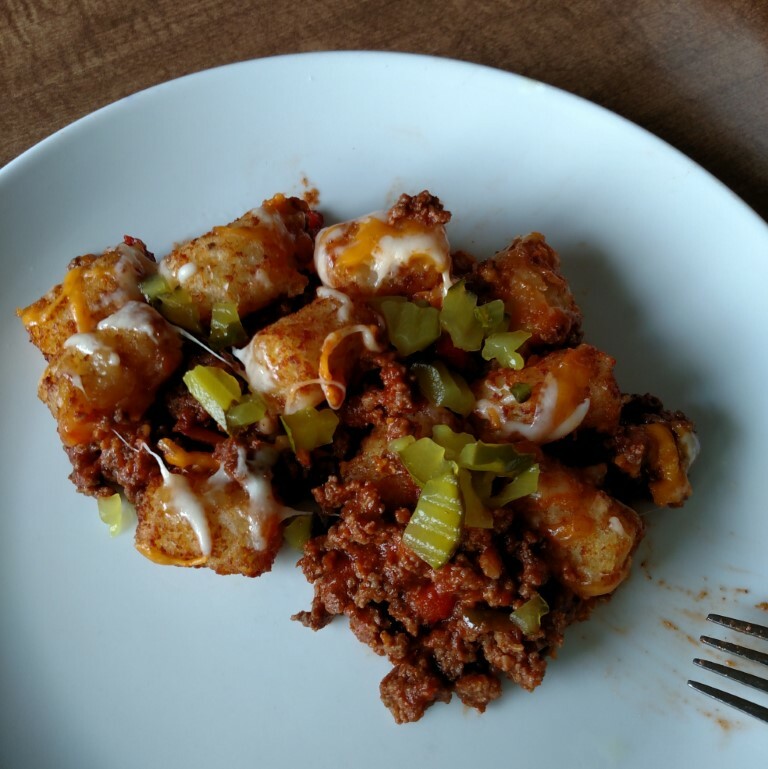 I found “Sloppy Joe Tater Tot Casserole” in one of our area newspapers. We’ve eaten this twice now and it’s a keeper with my family. The recipe calls for tomato sauce, brown sugar, Worcestershire Sauce, yellow mustard, and salt to make the sloppy joe sauce. I made it faster and easier by just using a store bought can of sloppy joe sauce. Heat oven to 350 degrees F. Spray 13×9″ (3 qt.) baking dish with cooking spray. Brown hamburger with onion. Drain grease. Stir in tomato sauce, brown sugar, Worcestershire Sauce, yellow mustard, and salt (or can of sloppy joe mix). Cook 2-3 minutes stirring frequently until bubbly. Line bottom of baking dish with half of bag of tater tots. Pour beef mixture on top of tots. Add 1 cup of cheese over the beef mixture. Add remaining tots and top off with last cup of cheese. Bake 45 minutes or until bubbly and tater tots are slightly browned. Top with chopped dill pickles. Note: I don’t do all of the layers. I put the sloppy joe/meat mixture in the bottom of the baking dish, add a layer of tater tots, and bake. After the casserole is baked I add the cheese and let it melt for 5 minutes, add chopped pickles, and serve. This recipe works great for my family of three (two adults, one toddler). We eat half and then I freeze the other half for a meal later. You can also find it on my “Recipes” page. Have you tried this recipe? What do you think? Do you have any special substitutions? Let me know in the comments below.